George M Taber, A Toast to Bargain Wines: How innovators, iconoclasts, and winemaking revolutionaries are changing the way the world drinks. Scribner, 2011. George Taber knows something about how seemingly small events can sometimes turn the world of wine upside down. He was the Time magazine reporter who covered the famous 1976 “Judgment of Paris” tasting where top French wines were matched against California Cabs and Chardonnays in blind tastings evaluated by famous French critics. The New World wines held their own and even took the top prizes in both red and white categories. Thus was a fermenting revolution recognized and encouraged. Now the issue isn’t so much Old versus New as it is Expensive versus Cheap and Elites versus Masses. Taber sides with a democratic vision of wine and this book is a celebration of the fact that there are more drinkable bargain (less than $10) wines in the world now than ever before. The glass is more than half full. Drink up! Taber’s celebration comes in two parts. The second half of the book is a bargain wine buyer’s guide. Taber provides top 10 lists of his favorite “$10 and less” wines and wine brands sorted by grape variety and region. He also recommends a couple of splurge wines in each category for good measure. My, what a lot of inexpensive wine George Taber must consumed to write these recommendations. Bottoms up, indeed! Here’s what I mean. The section on blush wines highlights 10 wines including a $3 Oak Leaf White Zinfandel (from Wal-Mart) and a $6 Riunite Strawberry White Merlot. I assume that Taber tasted the big selling Sutter Home White Zin and found it wanting since it does not appear on the list, but he doesn’t list all the wines he tried in each category, only the best ones, nor (and this would be particularly useful) the really really bad ones to steer clear of. The first half of the book makes the case that maybe you should take bargain wines more seriously (and not just because of the current economic situation). Taber sets out to undermine the conventional wisdom about wine. 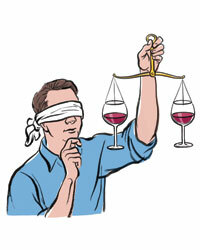 Maybe wine judges are as confused as the rest of us. Maybe taste is so subjective that your opinion really is all that matters. Maybe (gasp!) bottles and corks are a pointless anachronism when it comes to everyday wines and you should reconsider your prejudice against “box wines,” which have changed a lot since you tried them in college. My favorite chapters are the profiles of the iconoclasts who are leading the wine revolution. Taber’s reporting skills are put to good use in telling the tales of Fred Franzia (the godfather of Two Buck Chuck) and John Casella (the father of Yellow Tail wine). Both wines changed the world in important ways and it is interesting to have their stories told so effectively and to be able to see these two phenomena side-by-side. The final chapter (before the buyer’s guide) examines China. Will it too change the wine world? Maybe – that’s the answer here. China is still a work in progress and perhaps it is too soon to draw many conclusions. Taber does a good job pulling together different trends and facts. One of the ironies of this book comes from the fact that Taber needs to define what he means by “bargain wine” and value (like taste) is pretty subjective. He draws the line at $10, which is a good thing I believe since this allows him room to include a lot of pretty good wines in his lists and not just focus on extreme values. Ironically, however, a $10 wine is classified as “premium” and sometimes “super-premium” here in America. The majority of American wine drinkers think of a $10 wine as a splurge. I have friends who are afraid to try a $10 wine because they fear that they will be able to taste the difference and be forced to turn their backs on the $6 wines they’ve been enjoying for years. I wonder if wine snobs will be annoyed by George Taber’s book? After all, with this book Taber seems to suggest that democratic wines deserve the same respect as those Judgment of Paris aristocrats. Me? I’m just grateful that he’s done the dirty work of tasting and sorting all those really inexpensive wines so that I don’t have to! Bottoms up! I’ve spent the last couple of days reading Thomas Pinney’s masterful A History of Wine in America (Vol. 2: From Prohibition to the Present, University of California Press, 2005). If you want to understand how wine in America got the way it is, this is the best general reference I have found. Pinney devotes the last section of the book to what he sees is a fundamental battle for the idea of wine in American. It is a conflict between Wagnerians and Martians, he says. Wagnerians are always delighted to have a bottle of superlative wine, but their happiness does not depend on it, nor are they so foolish as to think that only the superlative is fit to drink. Their happiness does depend upon wine each day … good sound wine will not only suffice. It is a necessary part of the daily regimen. Wagnerians sing an appealing but fundamentally radical song in the American context, where wine is just one of many beverages and not always the cheapest or most convenient to purchase. Regulations that treat wine as a controlled substance are very anti-Wagnerian. Wagner founded Boordy Vineyads and was well-regarded by wine people from coast to coast. He is an important figure in the history of American wine, according to Pinney, and one whose idea of wine lives on in many forms. I guess you could say that Two Buck Chuck is a Wagnerian wine, for example, although I think there’s a lot more to Wagner’s idea of wine than just low price. Wagner promulgated his populist vision by promoting the so-called French Hybrid grape varieties on the East Coast and elsewhere. I think he wanted America to be Vineland (the name given it by the Viking explorers), a country covered with grapevines and abundant with honest, respectable wine. This is easier said than done, however, as Pinney’s history makes clear. Martians are inspired by Martin Ray’s idea of wine. Whereas Wagner was disappointed that America lacked a mainstream wine culture, Martin Ray was upset that the standard was so low in the years following the repeal of prohibition. He persuaded Paul Masson to sell him his once great winery in 1935 and proceeded to try to restore its quality with a personal drive that Pinney terms fanatical. He did it, too, making wines of true distinction — wines that earned the highest prices in California at the time. His achievement was short lived, however. A winery fire slowed Ray’s momentum and he finally sold out to Seagrams, which used a loophole in wartime price control regulations to make a fortune from the Paul Masson brand and its premium price points, starting a trend of destructive corporate exploitation that forms a central theme in Pinney’s book. Ray’s history is therefore especially tragic since his attempt to take California wine to the heights through Paul Masson ended so badly. Paul Masson today is an undistinguished mass market wine brand — as un-Martian as you can get. When wine enthusiasts of my generation think of Paul Masson (now part of the Constellation Brands portfolio), it is often because of Orson Welles’ classic television ads, like this one from 1980 promoting California “Chablis.” Roll over, Martin Ray! Martians and Wagnerians have two very different ideas of wine and it is a shame that one needs to choose between them. It seems to me that wine could and should be both a daily pleasure and an opportunity for exceptional expression. The good isn’t always the enemy of the great. But many people see it that way, including Pinney, who reveals himself to be a Wagnerian and expresses concern that the Martians have won the bottle for wine in America. The people who write about wine in the popular press largely appear to be Martians, who take for granted that anything under $20 a bottle is a “bargain” wine and who routinely review for their middle-class readership wines costing $30, $40, $50 and up. Even in affluent America such wines can hardly be part of a daily supper. They enforce the idea that wine must be something special — a matter of display, or of costly indulgence. That idea is strongly reinforced by the price of wine in restaurants, where a not particularly distinguished bottle routinely costs two or three times the price of the most expensive entrée on the menu. I guess I am a Wagnerian, too, if I have to choose, but I’m not as pessimistic as Pinney. I’m about to throw myself into full-time book-writing mode: I need to finish my current project this summer so that it can be in bookstores in early 2011. The more I work on this project the happier I am with its upbeat title. Grape Expectations started out as a simple pun on the famous Dickens novel, but it has evolved into something more. I have developed genuinely optimistic (if not “great”) expectations for the future of wine and I see the three forces I study in the book — globalization, Two Buck Chuck and the “revenge of the Terroirists” — as possibly bridging the Martian-Wagnerian divide. Can wine be both common and great? Why not? Wine isn’t one thing, it is many things to many people. No purpose is served in my view, by monolithic thinking. That’s my hope … and my Grape Expectations!